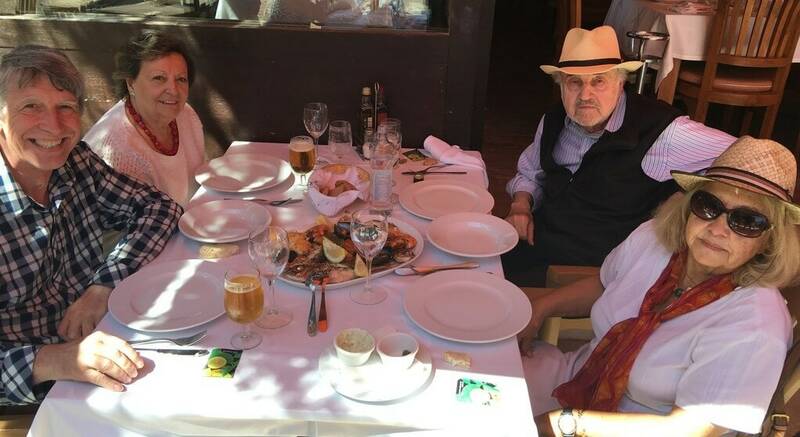 The day after I returned from visiting a friend in Asturias in Northern Spain, I left with Maria, Maria Victoria, and Miguel for the island of Ibiza. This was a mini-excursion for the four of us from the AAA (Association of Amigos of Archaeology) which Maria had done a fantastic job of arranging for us. 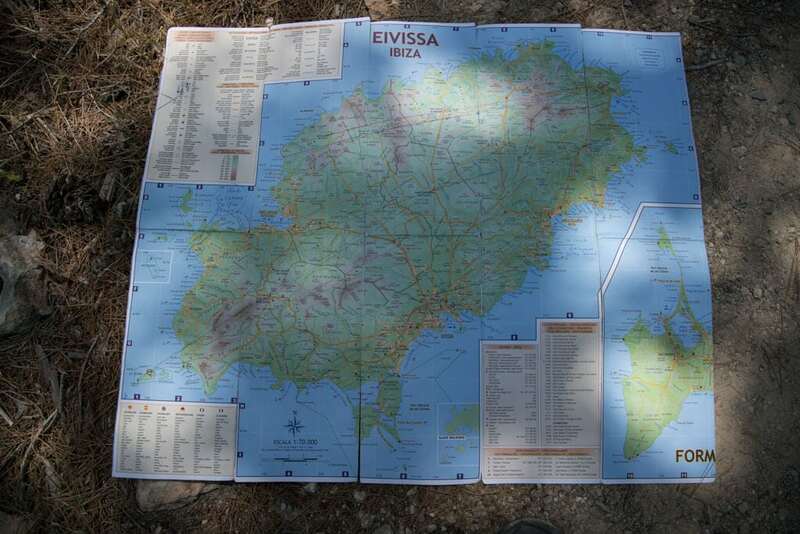 We had several days to explore the island of Ibiza, and one day on the island of Formentera. 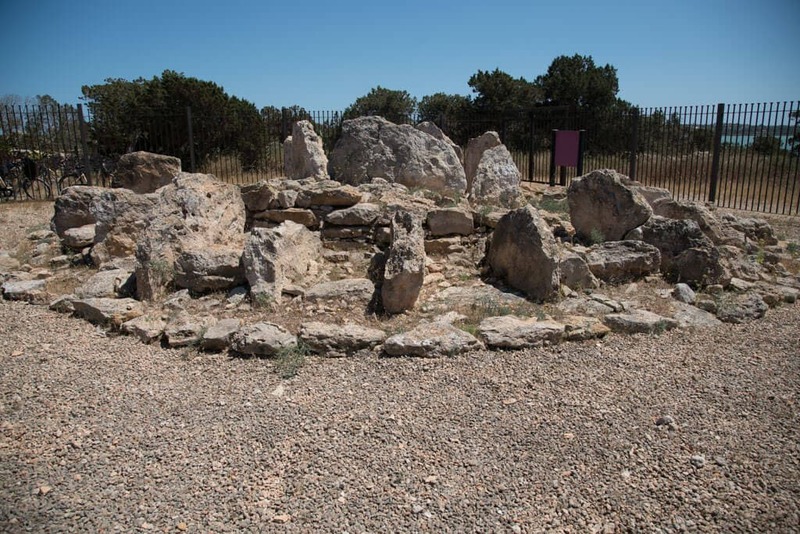 On Ibiza, we visited sites ranging from a Phoenician settlement of the 7th century BC to a church from the 16th century. There was an interesting cemetery at the 16th-century church. In addition to the commonly stacked niches, there were graves with tombstones in English. There were also Jewish graves with stones placed on top of the tombstones, as I had seen in the Jewish cemetery in Prague. The placing of stones on Jewish graves may be related to the permanence of the memory of that person, as opposed to flowers that do not last and generally aren’t used in Jewish cemeteries. Another grave was curious in that there were many round stones on top, all with hearts painted on them. The ethnographic museum had a wine press and mill, but the most interesting to me were the mannequins dressed in the traditional clothes of the island. 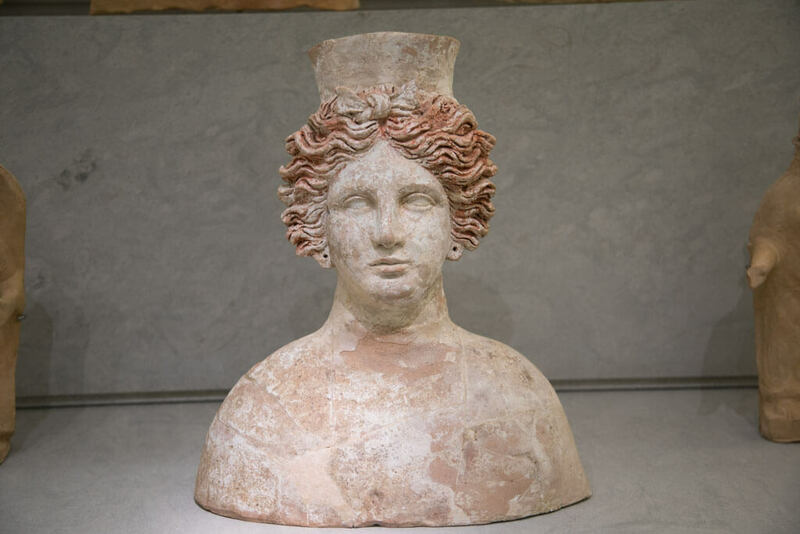 We visited the archeology museum and were given a personal tour by the director of the museum, which Maria the AAA archeologist had arranged. I found most interesting the prevalence of the god Bes on the island, including being represented on the ancient coins minted there. While the island was Phoenician, Bes was also important to the Egyptians. Bes was a protector of women, childbirth, and children. On the Ibizan coins, he is often portrayed lifting a hammer in one hand and a snake in the other. The museum is next to the necropolis of Puig des Molins. There is an impressive model of the necropolis in the museum, with overlaying sheets of marked Plexiglas that illuminate individually to indicate the portions from different periods. The necropolis is a large ancient cemetery. 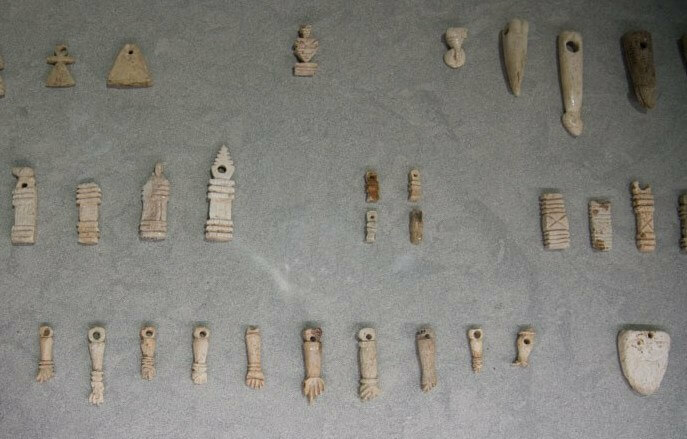 I have studied ancient amulets and was very interested to find out from the director that in this necropolis, the many amulets found were only located in tombs of women and children, never the men. We had an excellent lunch seaside, with the preparation of an island queimada afterward. The queimada is a well-known tradition in Galicia, the Northwest part of Spain. The purpose in Galicia is to ward off the evil spirits and witches. It is made with aguardiente and sugar, and is flambeed before serving. Aguardiente (literally "firewater") is also called orujo and is similar to a clear cognac or brandy. The waitress had a little difficulty lighting the queimada, due to the wind, but it ended up being a proper way to end a wonderful meal shared with good friends. Archaeology was our priority on the island of Formentera as well. We saw three megalithic settlements from 1900 – 1600 BC. The Ca Na Coste was a round megalithic sepulchral from the same period. Then there was Can Pins, a Roman settlement, and tower, dating to the early Roman Empire. As we traveled around the island, we found some ancient windmills, a couple of lighthouses, and a flea market. On one end of the island, Miguel wanted me to take a picture of a large black pirate flag at a restaurant on the beach, which I did. Fortunately, he didn’t ask me to take any pictures at the nudist beach we had just passed! The day after Formentera we tried to squeeze as much in as we could back on Ibiza, before having to turn the car in and head to the airport. We went to a typical house from the 17th century and took lots of pictures. We then visited Es Cuieram, which dated from 425 BC to 125 AD. 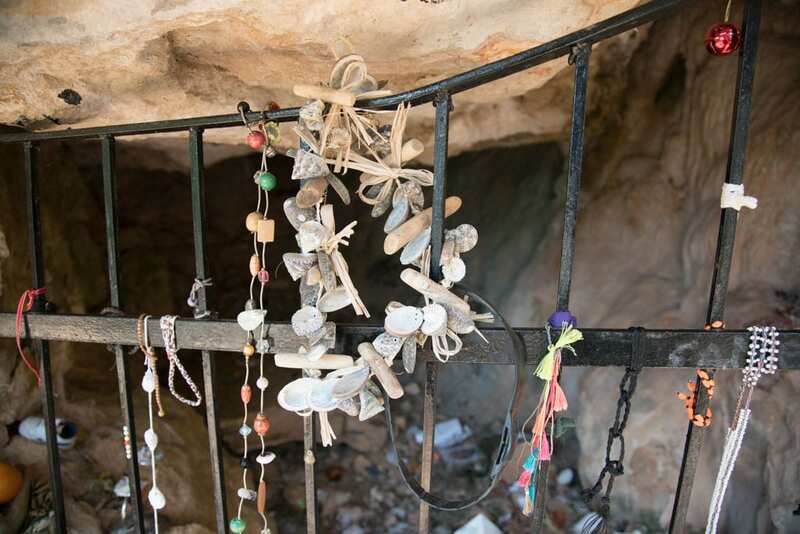 It’s a Phoenician sanctuary in a cave on top of a mountain. Even today people leave offerings there to the goddess Tanit. But most impressive was the fellow we met at the base of the mountain. He was German and comes to Ibiza every year to further his studies. He claims that he has determined that there are lines of energy linking sacred sites on the island, and takes small vials of water to each site to leave for a day or two to absorb this sacred energy. Then, back in Germany, he has the equipment to measure this energy and can make calculations to see if they support his theories. The map shown here is what he was using to mark these lines of sacred energy. For a final stop, after making a wrong turn and having to mark off our list an archaeological site, was a small group of Medieval houses that Maria had read were interesting. The problem was we could not find any signs, except one for the “Font (well) de Baláfia.” As the driver, I wanted to take that dirt road, but my three navigators insisted that if that dirt road led to the town, the sign would indicate so, rather than indicating a well. After stopping at a restaurant and me questioning the waitress, then the disbelief of my navigators when we came back to the sign, we returned to the restaurant so that Miguel could talk to the folks in the restaurant. 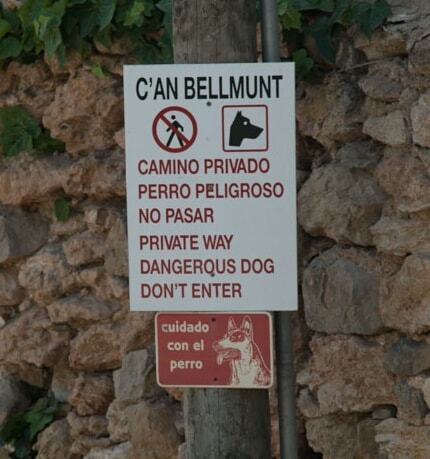 It was confirmed that the sign indicated the proper dirt road to the houses and I took us down the road. This was a narrow, hardly one lane, road with many pot holes and stone walls on both sides. If we had met another car from the other direction, one of us would have had a lot of backing up to do. Maria Victoria expressed a grave concern we might not have time to make this visit and get to the airport on time, AND if we ended up with a flat tire out in the middle of nowhere, we would be sunk. But, I said we've got a spare tire, and surely there's enough time. Maria and Miguel seemed to be willing to give it a shot, so I continued. Finally, we arrived at what is a group of five medieval houses with two refuge towers. It was very photogenic, but the visit didn't take long. Then we went to turn in the car and go to the airport to return to Madrid. I had just a few days left before it would be time to return to the USA, and have a couple of days there before leaving for a month in Peru. I got together with my friend Jose and some others to visit and have lunch. Jose shared that on the Metro that morning, he witnessed a group making their way home from an all-night bachelor party. The groom was dressed as a giant phallus, complete with testicles, and the six groomsmen were each dressed as a spermatozoid. Yes, on the Metro, crowded with people on their way to work! And no one paid much attention. That night I met with Jose Luis again for tapas at our favorite bar in the Plaza Mayor. This time we met with Miguel who was one of the directors I had worked for. Miguel brought us each a copy of both of the two books he has published. One, El Madrid de Los Austrias, “The Madrid of the Austrians,” began with Madrid in the 16th century with Carlos de Gante. It is particularly interesting because my great grandfather came to the USA from Austria. Miguel's other book, La Arquitectura de la Sierra Negra de Guadalajara, “The architecture of the black mountain range of Guadalajara” is also quite interesting. The description “black” applied to these pueblos relates to the color of the slate and stone that the buildings are constructed of. Years ago another friend, Fred, had taken me on a tour of some of these pueblos, abandoned, and they were reached only after a very long drive on various dirt roads. We conversed about the state of pay negotiations with the air traffic controllers. I remembered that there were large concessions and pay increases made in 1992 to ensure that there were no problems with the controllers during the Olympics. I thought that these were related to guaranteed overtime, almost doubling some of the salaries. But Miguel said that the increases were tied to the amount of traffic handled, and that this has declined somewhat in recent years, making the controllers restless. A couple of years ago there was a threat of a strike (yes, it's legal in Spain – no Reagan firings there), and the minister decided to stand up to the union. Spain has been in what they call their “crisis” for many years, with unemployment well over 20%. So, knowing that the public would have little sympathy for controllers striking for more pay when they make as much as they do (over 200,000 euros a year base plus significant extra depending on traffic handled), the minister released to the public the actual salaries they were paid, without names. There was no strike. I had one more visit to make before returning to Atlanta. My first Sunday in the Plaza Mayor in Madrid, I visited with Antonio from Hita as he sold his coins in the coin and stamp market. Antonio recited some poetry from the Medieval Libro de Buen Amor (Book of Good Love) and shared some refranes or proverbs. Jose and I were invited to his house in Hita for lunch. What an outing! Good friends, good wine, and good food, accompanied by many stories and jokes – this is what sensuous Spain is really all about. We started in Antonio’s wine cellar, Antonio, his wife Antonia, his brother Isidoro, his friend Angel, Pablo a neighbor, Jose and myself. There were four barrels of wine of different vintages and many many bottles stacked in individual cubbyholes. We started with some wine from 2016, taken from a large tank. But then we moved on, with a pitcher (or more) siphoned from the barrels from 2004, then 2001, and finally 1997. I wondered if we had done that backwards, because often the best wine is given first, with the lesser wines saved for sharing as the partakers get “happier” and less discriminating. The wine was accompanied by morcilla (blood sausage), chorizo (another smoked sausage), cheese, and bread. And all that was just the appetizers! We next moved upstairs for the actual lunch. The good fellowship was accompanied by more good food, and refranes, jokes, and war stories. Antonia, Antonio’s wife, had prepared an outstanding meal, and it was enjoyed as much as the comradery. But after we ate and digested for a while, we all went to a friend’s, another Antonio’s house to see his amazing library doors and wine cellar. His cellar has many (unused at this time) tinajas (large clay jars) that were used to ferment the wine. When I say large, these are six feet tall – see the picture. We returned to Madrid, and that evening I met some other friends to see some coins. The next day was my birthday, and I flew back to Atlanta. I will be adding a lot of material over the next few months. Please sign up for notifications as material is added. Emails are not shared with anyone.